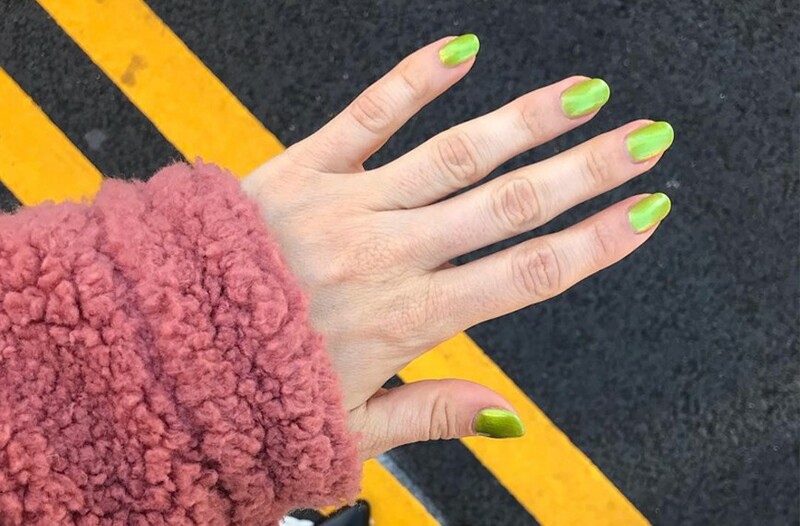 I’m not sure when the switch happened, but one day—fairly recently—my manicure colors of choice transitioned from your typical reds, pinks, and neutrals to what I can only describe as horribly ugly shades (I say that in the most endearing way possible). Think sewage and slime greens, burnt oranges, diarrhea browns, and neutrals that would match a turkey carcass. It’s not just my peculiar taste, either—I’m seeing the trend when I scroll through my Instagram feed, adorning the fingertips of influencers and celebrities alike (you know you’ve seen slime green rocked by Kendall Jenner and the Hadids). So maybe it’s been infiltrating my subconscious and influencing me on that level. Either way, it does seem to be a thing—and I hereby declare that everyone should try and be so daring as to decorate their nails with hideously cool hues. It’s certainly interesting, I’ll tell you that. The traditional, “safe” nail polish shades can get, well, boring. I’ve alternated between lavenders and barely there pinks for far too long. Reds? They stain my nails. Black feels outdated (to my Avril Lavigne worshipping days of middle school, to be exact). I find myself feeling incredibly liberated wearing bright and obnoxious shades. And I even get compliments. But celebrity manicurists beg to differ. “Muted browns, greens and burnt orange polish shades tend to look outdated and don’t agree with all skin tones,” says Jin Soon Choi of her eponymous nail salon. She would know—she’s manicured the hands of countless runway shows. I trust her implicitly, and yet there’s something that I just find so endearing about hearing people love my dead-leaf green polish. It’s fun to look down as you’re typing or holding onto your coffee and see an unexpected hue—so here I am vouching that wearing an ugly manicure is akin to strutting about town with your chunky dad sneakers or a faux-fur leopard-print coat. It’s a statement, and induces a bold confidence for being so rebellious. So while it may not be front-of-nail-salon material amongst the rows of reds and pinks and neutrals, I still hereby declare that I’m going to rock ugly nail colors from here on out—and you should too. Keep on scrolling for even more inspo. And to keep the paws healthy, here’s why you should get a waterless manicure. Plus this is how to stop nail biting in its tracks.